How Exactly do You Help Folks be Accountable? Home / Music Theory for the Bass Player / How Exactly do You Help Folks be Accountable? I read that one of the reasons you created the 20 unit program was to help folks be accountable with practice/studies. My question is, how does the program actually do that? Weekly emails that unlock new material. Lots of practice tips each unit and several motivational short videos throughout. Constant reminders to adapt to one’s own pace and at the same time not to get stuck on a unit. Many videos are designed for you to pop in and practice along with, which makes it much easier to do. The program builds step by step and gets progressively harder. Derek’s question got me thinking, because being accountable is indeed an important topic and one of the reasons I created the course. I am a Certified Tiny Habits™ coach and NLP Master Practitioner, so my teaching is heavily influenced by what I learned about habits, the use of language and how it influences our behavior. In the course, by the way, the outro tab has tips drawn from these sources). This is no voodoo or trickery or magic wand that will make it all effortless. None of this means that I can do the work for you. None of this means you will wake up tomorrow sounding like your hero or your best imaginable self. You will actually need to watch the videos, follow along, do the work. But, I can be helpful in a variety of ways, as mentioned in the email to Derek, and there is more. There is a large body of research on habits and productivity. Even if these words may seem like psycho mumbo-jumbo,keep an open mind for a second, because most relevant is: the research has gotten proven results that people were more inclined to follow through on what they wanted to do if it came presented in a certain way. There are strategies you can use (and are encouraged to use in the course) to make getting going on that practice routine easier. …has turned up strategies (some simple, some more complex) that can be valuable in directing our behavior. Advertisers use it every day in the form of language patterns. Politicians hire firms and spend big money so as to deliver their message so as to motivate the public to cast a vote for them. These aspects of motivational and behavioral research never interested or appealed to me, but what has been holding my attention for years is the study on how we can be better controlling our own behavior. We SAY we want to _______ (fill in blank with anything from health/fitness goals to life/financial habits to practicing goals, and we really do want it, but then we struggle following through. It does not have to be that way. Especially the research of the Stanford Persuasion Lab and BJ Fogg’s work around Tiny Habits shows us powerful ways to help us gain control. Other modalities I studied include NLP (the use of language to optimize behavior) and books such as The Power of Habit by Charles Duhigg (an amazing read). You can make steady progress with just 25 focused minutes ten times a week (more frequent shorter practice sessions seem to get better results than less frequent longer ones). Next to how to practice: what to practice. The course takes the guess work out of what to do next. I show you how to adapt it to your level. It does move quickly and is very ambitious, so I give plenty of tips how to take it at a slower pace. Distraction is the #1 enemy. Decide what to do. Then stick to it. Evaluate results about once every four months to assure you are on track and make adjustments (or ask for help if needed). Otherwise, focus in. I help with constant reminders and weekly emails with new content. Follow along and commit to give it your very best. There are no magic ingredients, no secret sauces, no shortcuts. You either do it or you don’t. Find a program that has good reviews and reasonable looking content, do your research, but then, do it and stick with it. The saddest thing to me is seeing people look around for the “best” fix and getting stuck looking; or dipping their toes here and there and as soon as they hit a little bump, they don’t know how to overcome it, label it “frustrated”, “bored” or “losing interest” until the next shiny thing comes around fueling some illusion of -finally – mastery. There is nothing wrong with you at all if you feel this way and I am not down on you for those feelings, I know them well. But there is no way but through them; keeping going is the only way. I have some tricks you can use to keep you sticking with the program. Now, most of this comes from Tiny Habits and essentially insists you make practice sessions so short and/or easy that they are impossible not to do. The secret is: before you know it you have done way more. Starting is the hardest part. The rest is easier. You can do it! How do I hold you accountable? Humps are part of the journey – embrace and transform them (use the tips in the outro tabs). 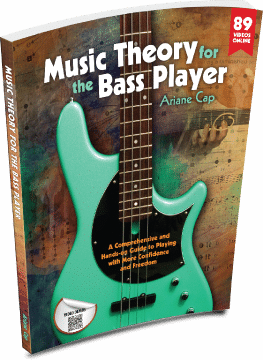 In creating a step by step, well laid out course that starts at the beginning and moves swiftly (this current one through music theory for the bass player). By massively routing for you! And 98% of course participants say they recommend this course. And I am not holding back the content or pace, I want YOU to succeed on a big scale! By second guessing and challenging internal beliefs that may not serve you. Or by being down on ourselves or you trouble yourself with “how hard it is”. If there is a voice that tells you “can’t, “could have”, “should have” or “never will be” – there is nothing whatsoever wrong with you. It’s when we get stuck on those voices, when we run into trouble. I write about letting those feelings move through without latching on to them, and I just flat out cheer you on throughout the course! One other big aspect: rewards! Getting better is a reward in itself, but it takes a little patience to feel that reward. Instant rewards help here! As my Tiny Habits teacher, BJ Fogg powerfully puts it: not repetition, but good feelings create habits. After you practiced, make sure to high-five yourself and reward yourself with a little something. It is very important to leave practice with a good, satisfied feeling. Makes it easier next time! Many have succeeded with this course, you can too! If being accountable is an issue for you, the course may just be what you needed. Remember, you have 15 days to try it risk-free. PS: We are soon rolling out the course in a different structure, so if you would like to take advantage of the one payment option at its current price point, please do. Thanks Mauro. If you are in at the current set up, you are in and nothing will change. Whether you have the payment plan or paid for the entire course, you have lifetime access and we will even keep the portal the same. Great tip about short focused practice being better than a few long sessions – my #1 problem. Also no distractions – my #2 problem! Thanks for commenting, Duncan, and you are definitely not alone with these being #1 and 2! It is definitely getting much better for me since I studied the Tiny Habits Method. Powerful stuff.